I'm a beauty product junkie. My husband calls me "a marketer's dream". Call it what you will, but I love trying new products, and LOTS of them. I've subscribed to countless beauty boxes and tried more brands than I can even remember. Some come and go, and some become holy grail products I've used for years and will use for years to come. Here's a roundup of my favorite products of the season, why I love them, and why I think you will too. 1. CoverGirl Perfect Point Plus Eyeliner $6.99 - I've used this eyeliner since I was in 8th grade. No joke. Are there better eyeliners out there? Sure. MAC's Pro Longwear Liner is my favorite, but it's $21 a pop. So for my basic, everyday liner, CoverGirl wins every time. 3. MAC Satin Lipstick in Brave $17.50 - You know how you have that one color of lipstick that's just PERFECTION? It goes with everything and suits your skin tone perfectly? Well, Brave is that lipstick for me. I had to try out quite a few different shades to find it, but it was well worth the money because this lipstick is just that good. Perfect formula, perfect color, just ... perfect. 4. Tarte Amazonian Clay 12 Hour Blush $29 - This blush is, well, blush. It came in one of my many beauty boxes and works well, but it's really no different than any other blush I've used before. But it is in my beauty bag and has been for awhile, so I've included it here. 5. Moroccanoil Treatment $15-$44 - Hands down the best hair product I've ever used. I've been using it for at least 10 years, and I'll use it forever. I put a small amount in my hair when damp, concentrating on the ends, and then blow dry. Adds volume, shine, control. LOVE! 6. IT Cosmetics Your Skin But Better CC Cream $38 - This is another product I've used for several years and have no intention of ever switching to anything else. I actually use this instead of foundation (after my moisturizer), and then use a light dusting of this powder over top. Great coverage that's buildable and light enough that it doesn't look or feel caked on. Highly recommend! I use the shade "Light". 8. Stila Huge Extreme Lash Mascara $23 - I have a love/hate relationship with mascara. I've never found one I've been in love with. I think I've used about 274 different kinds, and this is one of the few I've actually purchased a second tube of. So there's that. But seriously, this is a good one. It can get a little clumpy at times, but that's because it's thick enough to make your lashes look really long and dark, so I'm okay with that. 9. Philosophy Purity Made Simple Cleanser $11-$36 - This is the skin care product I've used the longest. I've been using this for close to 10 years, and it's worked well with all of the stages my skin has gone through: oily, dry, aging, and acne-prone. This is an excellent cleanser, and I highly recommend it. Too expensive? This is a great one you can pick up at your local drugstore for a fraction of the price. 10. Murad Intensive C Radiance Peel $55 - This mask is a powerhouse for your skin and one of my very favorites. It's pricey, so I only use it about once a month. It's a face mask chock full of glycolic acid and vitamin C. It stings a little as it takes off the dead skin cells, but when you rinse it off you'll definitely notice your skin looking brighter. 11. Clarisonic $129 - I probably would have never bought this for myself, but my husband bought this for me as a surprise one year. I was skeptical, but this has become a staple in my beauty routine. The spinning brush head deep cleans my skin, getting off every trace of makeup, while exfoliating. There are different brush heads depending on your skin type and whether you prefer soft or harder bristles. I actually buy my replacement brush heads here and save quite a bit of money. 12. Soo Ae Donkey Milk Sleeping Mask $3.30 - I received this product through my Walmart Beauty Box subscription, and although the name sounds kind of gross, I actually really liked it. I wasn't a fan of the idea of sleeping with a mask on my face, but it's more of a thick, hydrating skin cream than a mask. My skin looked amazing when I woke up in the morning, so this product is a winner for me. Each packet is for a single use. 13. Frankincense Essential Oil $15.75 - I use lots of essential oils in my daily routine, mostly for scenting my home naturally and for cleaning, but frankincense is one oil that I love to use in my skincare routine. I put a few drops of this in my DIY makeup setting spray, as well as mix a drop or two with my moisturizer or serum when my skin needs a little pick-me-up. There are lots of brands and options out there, but this is the brand that I use. So there you have it! 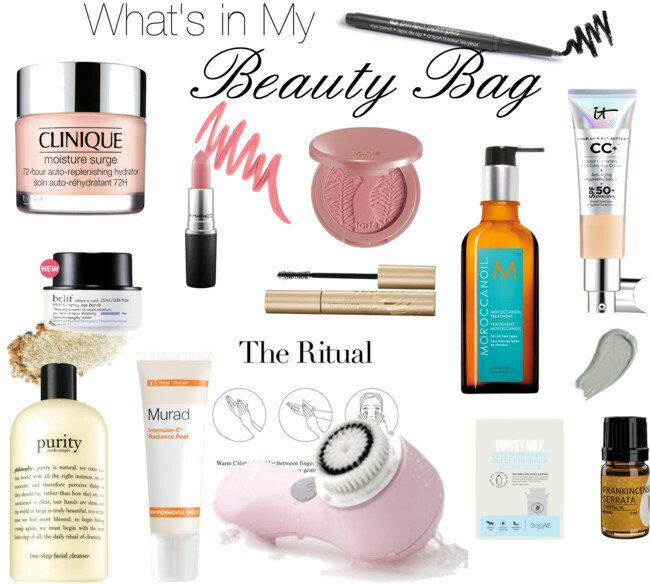 What's currently in your beauty bag? Do you use any of these products or have others that you think I should try? Let me know in the comments! I love all those products! I wish some of them!